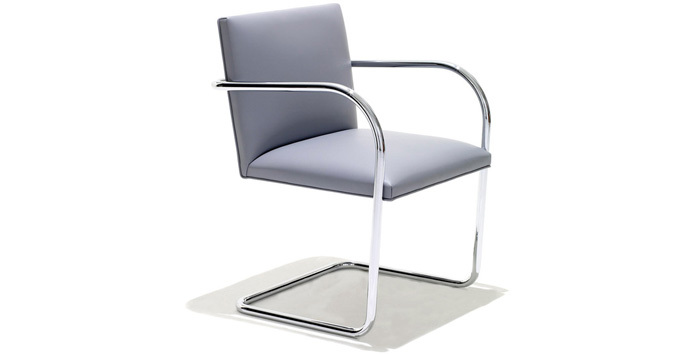 The Brno chair is a modernist cantilever chair designed by Ludwig Mies van der Rohe in 1929-1930 for the bedroom of the Tugendhat house in Brno, Czechoslovakia. One of the first cantilevered chair designs to produce, Ludwig Mies van der Rohe Brno Chair (1930) is the most elegant of its kind. The mirror-finish steel frame, chrome tubular fluid is bent into a sinuous form a single piece, which supports the sitter while gracefully apparently weightless. A long plate chroming process ensures a triple resilient, rust-resistant mirror-quality finish. The padded seat is upholstered in supple full grain Spinneybeck leather ¿long-lasting appearance retention and ease of maintenance, two particularly important features for offices and waiting areas. The manageable weight design also allows use around restaurants and conference tables. 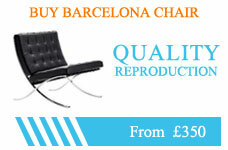 The Brno chair is a registered trademark of Knoll, Inc. Made in Italy.